Life gets busy. No work on Decline & Fall for the time being. I spent part of Jan/Feb reworking my notes on designing SCA war scenarios, and then gave a class on them. Some more editing is required, but its close to publishable. 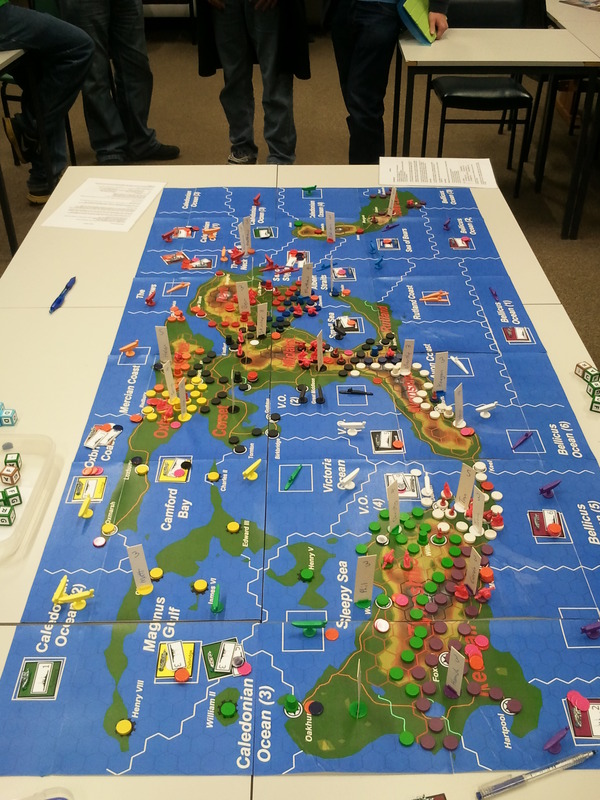 New project – designing the grand strategy game for Buckets of Dice 2011. The core idea is to mix a five-way battle over North America with the two-way conflict between Heavan and Hell. This will build on the game system used for Collossus of Atlantis (CoA) last year. Each team should have 5+ players. Each player will have a specific role ( President, General, Raider, Farmer, Engineer) that will give them action options in the game in addition to the standard options (move, fight, and harvest resource). In CoA I let players have two roles, but I think this gave them too many choices. The Presidents will have the ability to change roles in their team. An option I am considering, given the presence of team Hell. If included, the possibility will be communicated in advance to the players. Looking at five game maps, each with 15 nodes for locating units and resources. The maps will be: Pacific Coast, Atlantic Coast, South, Mid-West (central), and North. Each team will start largely in control of one of the maps. terrain will be a mix of Cities, Farms, Factories, and Wastelands. 20 minute map turns for on mao actions, 10 minute interaction turns for trade, diplomacy and alliances while the GMs tidy the map. Three main types of units: Armies, Raiders, and Militias. Each team will have at least five of each unit type. Armies are the remnants of the US armed forces, regular troops that do good things as long as you have parts and oil. Raiders are your Mad Max irregular forces. Weaker than Armies, but they can be hidden off the map, and then deployed to raid/ambush vulnerable enemies. Militias are home defence units, which change sides when their home region is captured. Each team will also have one nuclear weapon. This is a one shot wonder, which the team must locate in hiding on the map. So it can be captured or destroyed. Lets hope the President does not lose the bit of paper with the codeword on it. I might also allow some special capability units to be built (Helicopters, Submarines), but that is chrome for a final polish once the main design is sorted. Oil, Parts, and Medical Supplies are intended to be finite resources that will be exhausted in-game. This allows people to try strategies based around early resource capture, or hoarding resources for the end-game, or expending resources for early advantage. Population grows if you have food, and food just grows. Medical supplies prevent plague from decimating city populations and army strength. Will hopefully be a little simpler than CoA. It will still be 3d6 + two random unit strength variables, but the defender will have a static defense (11+variables) for the attacker to beat. Doubles and triples cause more casualties. Defeated side gains veteran strength points. I will do some playtesting to see if more damage/pain is required.